Notes: Made by one of the newer New York State distillers Adirondack Distilling Company ( not to be confused with the Lake Placid Distilling Company which is actually located in the Adirondacks). ADK is located in Utica, New York in the foothills of the Adirondacks (meaning you can still get there during winter), Utica is also home to the F.X.Matt Brewing Company. 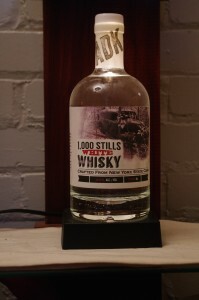 The 1,00 Stills name refers to the Adirondacks during prohibition ( land of 1,000 stills – which it had at least that many by various accounts due to the fact it was a large,rugged and largely forested area). This recipe is descended from one of the moonshiners operating in the area at the time and revived by the company. First Impression: Deep corn/grain notions off notes, very pleasant bouquet with whiffs of alcohol very much in background and no off notes. Well done distillation and cuts ! Drinks: Works well int the standard white whiskey drinks, also is a grainier and more flavorful stand in for a vodka, especially for things like a Bloody Mary. Final Thoughts: Overall a pleasant and nicely distilled white whisky made from New York State corn and water.